Does the forecourt of your business need redesigning, or does your home lawn need sprucing up? 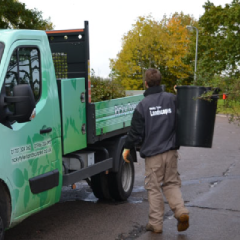 Whichever one you need, Ricky Tyler Landscapes can provide professional commercial landscaping and grounds maintenance services for businesses - as well as highly experienced gardeners for residential homes - in Biggleswade, Bedfordshire and nearby. On the business side, we have worked with a wide range of businesspeople and authorities from landlords in Stanford to local schools in Sutton and can adapt our skills to many terrains. The services we cover for both commercial landscaping and grounds maintenance include trimming hedges, line marking for playgrounds and fence repairs, among a wide range of tasks that also take into account weeding and grass cutting. We can offer these services whether its weekly visits to Dunton or a seasonal tidy-up in Northill you require. Wherever in or around Biggleswade, Bedfordshire it is, we can work to a schedule that suits your needs. As for garden maintenance for residential homes, including lawn care and turfing, we can take on board a variety of tasks so you don't have to. These include keeping your flowerbeds weed-free, taming your hedges before they get out of control and proper disposal of garden waste. We can do all this and more to a weekly, monthly or fortnightly schedule that's tailored around whenever's most convenient for you, wherever it is you live in Biggleswade or nearby. You can also rest assured knowing that all our staff are fully CRB-checked and have all the necessary insurance and health and safety policies. You'll also be able to recognise them from Eyeworth to Old Warden and Sandy to Langford by their distinctive smart uniforms. And ultimately, whether its grounds maintenance and commercial landscaping for a business you require or lawn care and turfing for your home, a discussion with us about your garden needs will come with no charge and no obligation. Ricky Tyler Landscapes can provide gardening and grounds maintenance services including Biggleswade Grounds Maintenance covering Biggleswade, Bedfordshire .